I’m always on your case about making things from scratch because it will be healthier. And you’ll usually save money. But mostly it’s so you can control how much sugar and additives are going into your system. 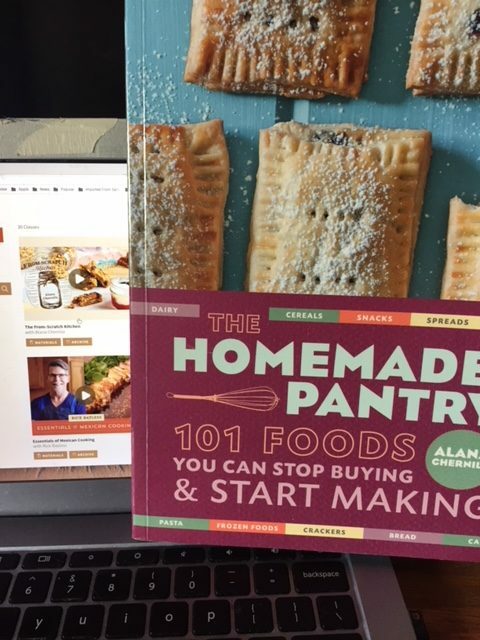 Last year I bought The Homemade Pantry: 101 Foods You Can Stop Buying and Start Making and it was so inspiring. And just recently, Craftsy had a big sale on their classes…everything was under $20….so I picked up The From-Scratch Kitchen by the same author – Alana Chernila. I used to make tortillas all the time from scratch. It was back when I felt I had more time. The truth is I have as much time. I just don’t spend it as wisely as I used to! I’m getting better. The tortillas you get in the store are pretty good. Most of them are just made out of the basic ingredients with no preservatives. Still, I have to tell you it’s wonderful to eat a handmade flour tortilla right out of the pan with a little bit of butter. Corn tortillas need a bit more finesse because they dry out. My favorite thing to do with them is to lightly coat them with oil, bake and then salt them up. I think they’re some of the tastiest chips ever. I also love making mayonnaise. And lately, I’ve been making hummus since I like adding more lemon juice and trying different add-ins like olive tapenade from Trader Joes. Also, I used to keep dry mustard powder around. (note to self…add it to the shopping list). You know the hot mustard packets you get with takeout Chinese? It’s just dry mustard powder mixed with some water. And it’s required in this household for egg rolls and chicken strips. Yogurt was a major staple that I’d make. I love very firm yogurt that’s lime flavored, and I just ran out of steam trying to make it easier. I’m now inspired to get some key lime flavoring from King Arthur and some yogurt culture from Amazon. Making it in the Instant Pot is a lot easier though then in the slow cooker or on the stove. I’ve tried pickles and sauerkraut on my own and they were OK. So I’m looking forward to trying her recipes. I want to pickle beets and cauliflower. I’m also looking forward to making catsup. I’m astonished at how much sugar is in the store bought bottles! What I want to try is making toaster pastries. My husband eats one brown sugar & cinnamon pop-tart every morning for breakfast. Well, except on weekends. Then he eats two chocolate fudge ones. He’s a pop-tart monster. I’m hoping I can make them better so he never looks back. Plus, I stopped being able to easily make pie crust. Somewhere along the line, it just stopped working out! So I plan on practicing making that from scratch again. So What’s In the Craftsy Class? The recipes are the same as in The Homemade Pantry but you get Alana walking you through the steps and options you have for making adjustments. The recipes she chose were what she felt were the most common pantry staples. Alana is engaging and has lots of tips for saving money and increasing the flavor. The pace is good, and it’s easy to skip around to the sections you’re interested in.